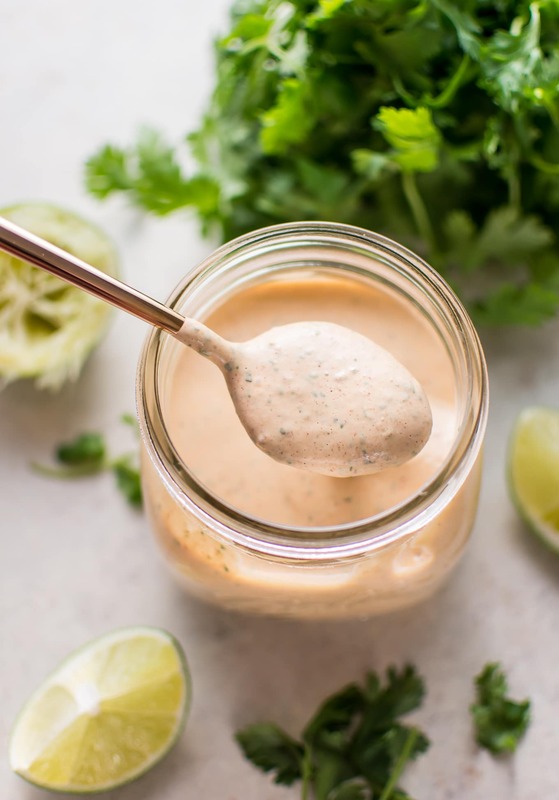 Chipotle lime ranch dressing is smoky, tangy, and as spicy as you want it to be! This southwest ranch dressing is the ultimate topping for salads, tacos, wraps, or even for dipping chicken strips or vegetables. This post was originally published on May 4, 2016. I am going through and updating some of my old posts with new photos, better info, and more clearly written recipes. This chipotle ranch dressing is everything you need to kick up the flavor in your salads. There are several variations of this recipe floating around the internet – and for good reason. Chipotle ranch is just so good. If you’re a regular reader of this blog, you’ll know that I’m not so good at handling spice. That’s ok, though… you can add as much as you want to this dressing. I used one smallish chipotle chili pepper and a teaspoon of the adobo sauce. That was enough kick for me, but I know that others may want it much hotter. Heck, add some chipotle chili pepper too while you’re at it if you want to set your mouth on fire. The lime and sour cream (or Greek yogurt if you prefer) add a nice cooling sensation to this dressing, which offers a good contrast to the heat. This dressing hits all the right notes, basically. This dressing is super easy… you just chuck everything in your food processor. It’s tasty right after you whip it up, or you can chill it for a bit and it’ll thicken up (I prefer to chill it for an hour or so). Chilling it will make it more of a dip consistency, so perfect for dipping vegetables. That sour cream + mayo combo is what gives that signature ranch flavor. If you love ranch dressing, you can also check out my recipe for (not spicy) homemade ranch salad dressing. I originally made this spicy ranch dressing with sour cream, but I did a bit of testing, and it’s every bit as good if you substitute Greek yogurt for the sour cream, and it’ll save you some calories. I used 2% plain Greek yogurt. If you’re wondering about chipotle ranch dressing calories, it’s about 46 calories/tablespoon when using sour cream, so a bit less if you use plain Greek yogurt. Let me know if you’ve tried this southwest ranch dressing recipe! Questions or comments? Let’s chat below! Add all ingredients to the bowl of a food processor. Process on high for about 30 seconds. Serve immediately or chill for an hour (or longer) prior to serving. Will keep in the fridge for a few days. I realized that the size of the chipotle chili peppers vary depending on the brand you buy. I would suggest using a SMALL pepper unless you want this recipe really spicy. Greek yogurt makes an excellent substitute for sour cream if you want to be more mindful of calories. Recipe makes about a cup of dressing. Currently wishing I could take a bath in this dressing. Seriously, it looks and sounds that good! Love the twist of lime! This looks delicious! I am pinning this so I don’t lose the recipe. Thank you!! Hope you enjoy it. You have managed to convince me that this is probably the best dressing out there! Creamy, zesty, smoky, spicy, fresh tasting. Yum. Aw, thanks!! Let me know if you try it! Made this dressing last night for our Deconstructed Shrimp Salad with all the fixings! This was so amazing! Hubby and our two kiddos raved about it and want me to make more soon! I used fresh garlic & sourcream (didn’t have powdered garlic or powdered onion on hand so I omitted the onion with no sacrifice to flavor…al all!) …can’t wait to try with Greek yogurt in place of sour cream! I’m so glad you guys all loved it!! And your deconstructed shrimp salad sounds delicious!! Mine turned out SUPER spicy. I had to make a second batch with no pepper and blend the two together in order to be able to eat it. I will know to cut that pepper in half next time. Geez, I’ve made this plenty of times, and one pepper doesn’t usually do that. That’s good to know! I am not able to handle spice very well myself. I didn’t realize that the peppers can come crazy hot. Thanks for leaving a comment! Glad you were able to still enjoy it. This dressing tastes wonderful, I love the smoky flavor! I used 2 tablespoons of dried cilantro rather than fresh and I have no regrets. I’ll be writing it down in my book! So glad you enjoyed it!! Thanks for leaving a comment. It tastes great. There are about 45 calories per oz. I wonder if you can get it lower by using a 1/4 cup of mayo, instead of 1/3, with no sacrifice of the taste. Most of the calories come from the mayo. Be careful too much Chipotle is deadly. Made this and loved it! Do you have any macro nutrients for it? Specifically, calories, net carbs, protein and fat? Thanks, Carrie! So glad you liked it. I don’t currently include nutrition info on my recipes – sorry. I may at some point in the future, but I don’t have a reliable way of calculating them right now that isn’t extremely time-consuming. Can you finally make this for me already? It’s been long enough. God. I am pretty sure I’d love it. Preferably on a salad. Hey, I am considering the dip for dipping Cuban style marinated chicken and steak kebabs (Cumin, Lime, Garlic and onion…) what do you think? This look amazing! I am going to make it soon! Made this for my hubby today. Used it on grilled chicken Sammy’s with avocado and bacon for his. I used half sour cream and half Greek yogurt. That’s what I had on hand. Was perfect! Awesome recipe, thanks!! I love adobo peppers!! I usually use what’s left in my the can a pepper or 2 at a time to accompany the main dish. I have Mexican shredded chicken in the crock and will serve it over cilantro lime black bean rice. Add home made pico and cheese to these burrito bowls and slather the top in this amazing delish dressing! So happy you liked it!! And your comment made me hungry haha. Awesome recipe! My husband and I love it very much. Thanks for posting it =). There’s a spot in my home town that has an amazing Chipotle dressing that I must reverse engineer. This looks like a great place to start. Can’t wait to try this. I plan to make and mix with brown rice, tomato, red onion, topped with cubed grilled chicken and avocado. The other dish I’m looking forward to is manifested by making nachos with this on the shredded cheddar before baking, then plate the chips and cover with chopped gem lettuce that’s been tossed in a light Olive oil and lime dressing, salt and pepper, tomatoes, avocado.. and a little of the Chipotle ranch on top. Thanks, Natasha, for the post. You rock! I’ll report back. Ooh I hope you’re able to replicate it, Mike!! Keep me posted. Your comment is making me hungry… I could use some nachos about now! I would love to try this dressing but I live in Switzerland and don’t no what’s: chipotle chili sauce… is it like Tabasco? And what’s adobo? Excellent recipe. Exactly what I expected and better. Thanks for sharing. This is really delicious and so easy. I didn’t have enough sour cream so I mixed in some plain Greek yogurt. I also added a teaspoon of maple syrup because I wanted a little sweet contrast with the spicy notes. This dressing makes an excellent macaroni salad. If you add some chopped veggies and a can of drained black beans, it makes a lovely side dish or meal. Love your additions! So happy you liked the recipe. That macaroni salad does sound good! This dressing is absolutely delicious! My husband and I went out to a local restaurant and had a “BLT” salad with a spicy, smoky creamy dressing, so I wanted to duplicate that – your dressing fit the bill perfectly! Can’t wait to try it on other things. Thanks!